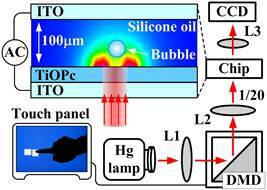 We develop light-driven optoelectronic tweezers based on the organic photoconductive material titanium oxide phthalocyanine. These tweezers function based on either positive or negative dielectrophoresis (nDEP). The dynamic manipulation of a single microparticle and cell patterning are demonstrated by using this light-driven optoelectronic DEP chip. 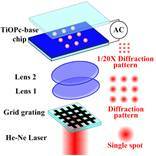 The adaptive light patterns that drive the optoelectronic DEP onchip are designed by using Flash software to approach appropriate dynamic manipulation. This is also the first reported demonstration, to the best of our knowledge, for successfully patterning such delicate cells from human hepatocellular liver carcinoma cell line HepG2 by using any optoelectronic tweezers. A laser diffraction-induced dielectrophoresis (DEP) phenomenon for the patterning and manipulation of individual HepG2 cells and polystyrene beads via positive/negative DEP forces is developed. The optoelectronic substrate was fabricated by organic photoconductive material, TiOPc, via the spin-coating process on the indium tin oxide glass surface. A piece of square aperture array grid grating was utilized to transform the collimating He-Ne laser beam into the multi-spot diffraction pattern which forms the virtual electrodes as the TiOPc-caoting surface was illuminated by the multi-spot diffraction light pattern. HepG2 cells were trapped at the spot centers and polystyrene beads were trapped within the dim region of the illuminating image. The Fresnel diffraction image illustrated the distribution of trapped microparticles. This concept of utilizing laser diffraction image to generate virtual electrodes on our TiOPc-based optoelectronic DEP chip extends the applications of optoelectronic dielectrophoretic manipulation. Tung-Ming Yu, Shih-Mo Yang, Chien-Yu Fu, Ming-Huei Liu, Long Hsu, Hwan-You Chang, Cheng-Hsien Liu, “Integration of organic opto-electrowetting and poly(ethylene) glycol diacrylate(PEGDA) microfluidics for droplets manipulation,” Sensors and Actuators B: Chemical Volume 180, April 2013, Pages 35–42.